Our focus in on delivering market leading grooming, spa and body treatments for our canine clients. Unlike pets stores whose primary concern is on retail our focus is on delivering quality grooming care in a spacious and relaxed environment. Please see below further details on what makes pooch Dog Spa the only choice for your pooches grooming needs. The comfort, safety, and happiness of all our canine clients is of utmost priority to our trained and caring staff. 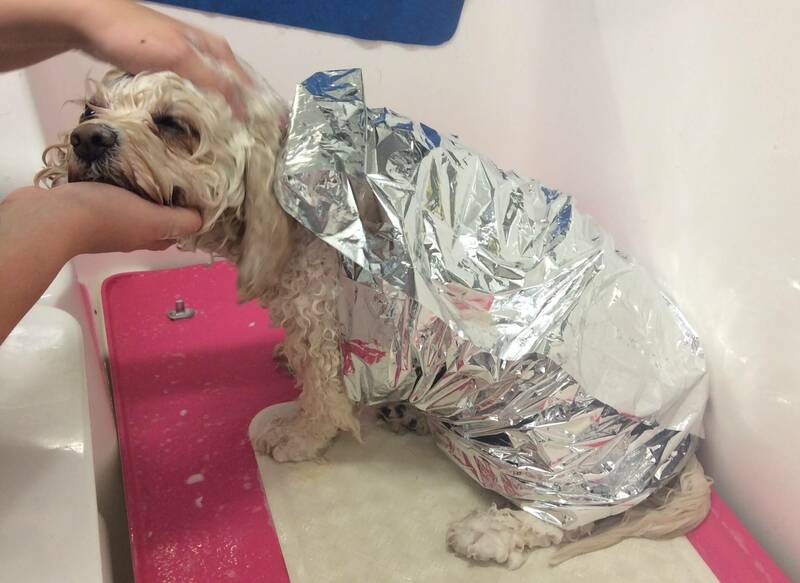 Pet parents can have incomparable peace of mind that they are treating their beloved pooch to the quality care they deserve when they visit pooch Dog Spa. During treatments cuddles are given in abundance, and we will never rush a treatment thus ensuring each pooch has a positive, loving, and relaxing experience. Our spacious air conditioned spa has been designed with the comfort of each of our canine clients in mind. From the moment of arrival each pooch is transported to a haven of relaxation, luxury and a healing world of calm for a complete sensory experience. We have a strict no drying cages policy. All pooch’s are finished by hand by our experienced stylists. We choose this for the safety and well-being of our canine clients. Our grooming services are delivered in separate treatment areas so each pooch has a relaxing and individual experience free from the distraction of other canine clients. Products used in the spa are all cruelty-free and made from naturally derived, chemical free ingredients. They are guaranteed to be free from the synthetic materials, chemicals, and unnatural ingredients found in many of today’s grooming products which can cause skin irritations and allergies. We are proud to offer these products as this is the only way to guarantee the spa uses the safest, purest, all-natural ingredients for your pooch. After consultation each pooch is shown to their individual waiting suite while their therapist prepares their treatment. Each waiting suite has a super comfy bed and fresh water so pooch can relax while benefiting from essential oil therapy and relaxing music. We do not use cages in our Spa. A comprehensive range of affordable grooming and spa treatments are on offer to make all our clients look and feel like a totally pampered pooch. On arrival each pooch receives a pre-treatment consultation where specific skin, coat, or emotional needs will be discussed with pet parents. 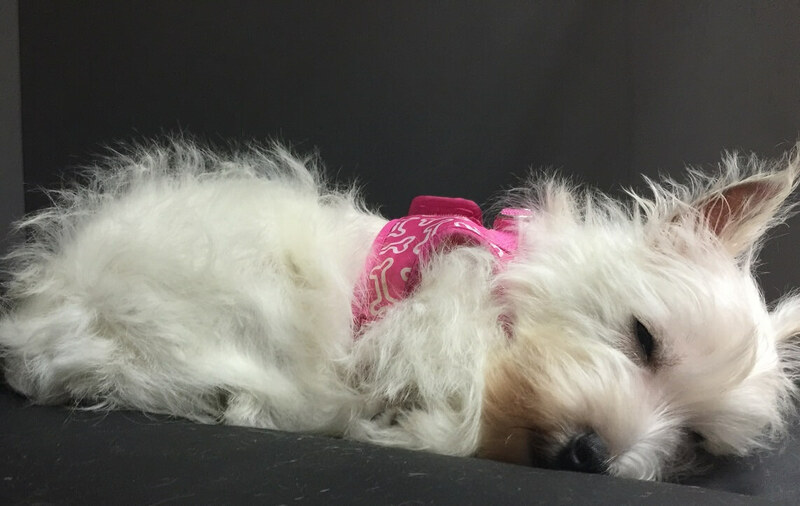 This ensures each pooch receives a tailored treatment, and any specific requirements are discussed and agreed with pet parents prior to their grooming or spa experience. We offer free familiarisation visits to help get your pooch used to the grooming salon and grooming experience. We give your pooch lots of cuddles and praise, introduce them to the staff and generally make their first visit an all-around fun experience. For puppies their early experiences of grooming can set the stage for how they respond to being groomed for the rest of their life, so its vital to make the experience as enjoyable and positive as possible. We have extensively researched the professional grooming equipment on the market and purchased only the best for use in our Spa. 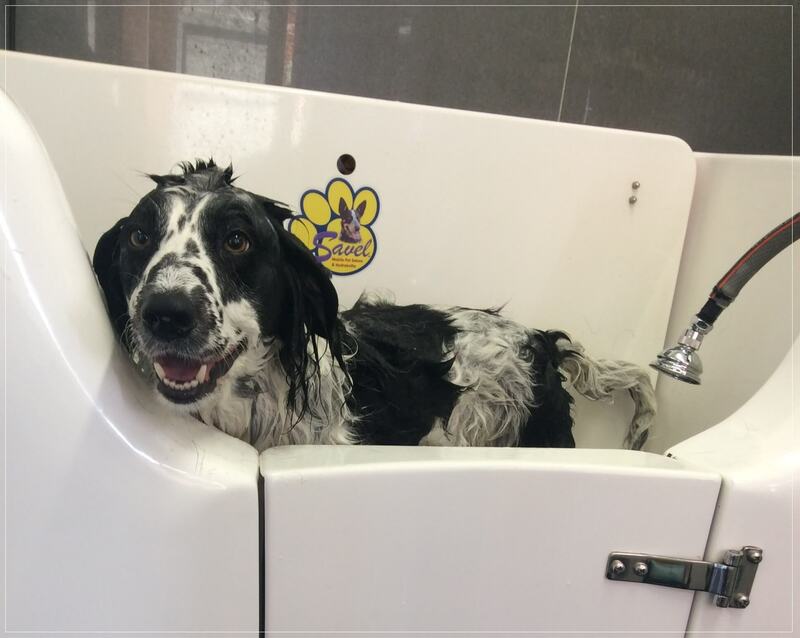 Our Hydro-Massage Baths massage and stimulate the skin, so it’s not only a very effective way of thoroughly washing our canine clients but also provides a therapeutic water massage. This massaging action helps with blood circulation, relieves tired muscles and has been found to be beneficial for older dogs or those suffering from arthritis. Our grooming tables feature the very latest in safety harnesses to ensure pressure is not put on your pooch’s trachea whilst being groomed, common with standard grooming noose restraints. For our canine clients with arthritis, back, knee, elbow or hip problems our tables are fitted with harnesses that take the weight off that area for added comfort. 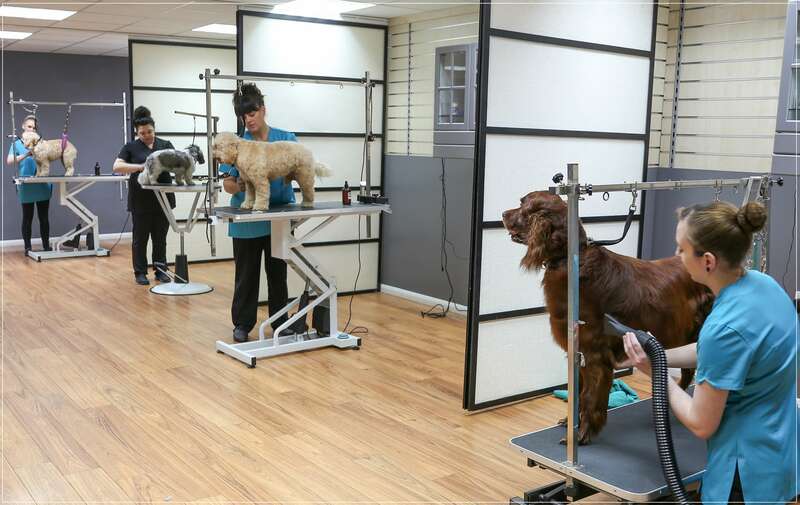 All canine clients are dried by hand by our experienced stylists. We do not use drying cages or cabinets in the Spa. We choose this for the safety and well-being of our canine clients, and while this increases the treatment time we refuse to compromise by operating equipment and practices used by other groomers. 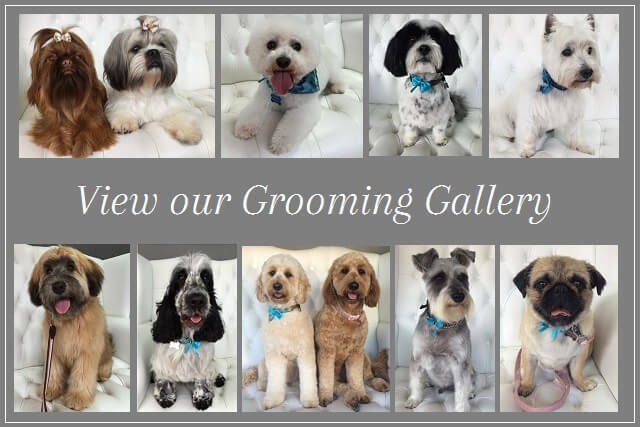 For clients that are not in a position to drop off and/or collect their pooch but want to take advantage of our grooming and spa treatments we offer a pick up and drop off service. Click here for details. Staff trained in canine first aid: We pride ourselves on the work we do with aged, ill, and disabled dogs. Pet parents can be confident that their pooch’s specific needs are understood and cared for by our qualified team.